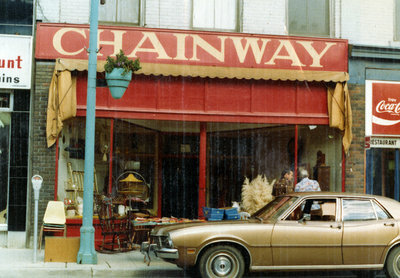 A colour photograph of the Chainway store located at 123 Brock Street South. This building located at 123-125 Brock Street South was built by Joshua Richardson (1813-1883) in 1877-78 following the Great Fire of October 16, 1877. The store was originally the dry goods shop of Hamilton and Harrower (owned by a partnership between James Hamilton and Robert Wright Harrower). Hamilton and Harrower were at 123 Brock Street South and Andrew M. Ross, another dry goods dealer at 125 Brock Street South. 123 Brock Street South, 1977, Robert Kirk. Whitby Archives D2013_005_010.